Can’t remember when I first bought my first USB pendrive. I presume it was something like a 256 Megabytes, acting as an MP3 player and costing some 70 euros (about 90 USD). Back then, it seemed as a lot of space available and so comfortable to bring along with you. I’ve been given a brand new 256 Gigabytes USB pendrive from a friend: it’s a no-brand, made in China and very low-cost (about 9.95 euros). 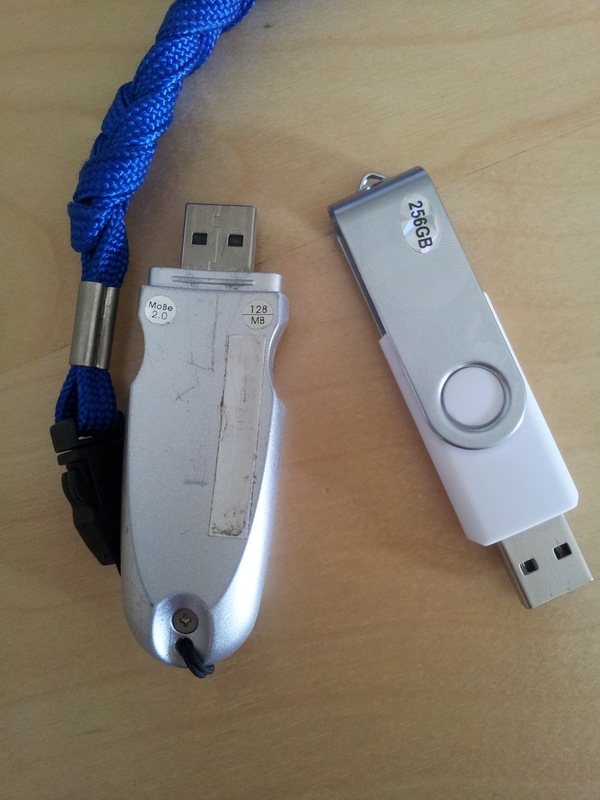 Check the photo: it’s compared to a colleague’s 128 Megabytes old pendrive. This is how far IT and storage has gone: 1.000 times the storage in less than 10 years (and about 1/7th the price)! So funny, today cloud storage and ubiquitous wireless connection has made less convenient USB drives swapping for almost everyone. What am I going to do with this hefty USB drive? It’s going to be a perfect companion to my trusted Raspberry Pi! Small server with huge storage! This entry was posted in Electronics, Hardware, Media, Storage, Tech industry, Technology and tagged pendrive, Technology, USB, USB drive, USB storage. Bookmark the permalink.